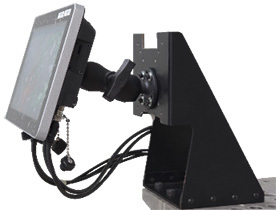 Computers used in trucks, cranes, forklifts, military vehicles, factory assembly lines, and numerous other industrial and vehicular applications are very different from those that people carry around. These heavy-duty panel computers are mounted wherever they are needed and so that they are easily accessible while working. They must be tough and durable and vulnerable because they are tools for the job. They must be easy to use, their displays must be large enough and bright enough to see. Their user interface must be simple and reliable. Winmate's heavy-duty G-WIN panels are clearly built to handle shock and vibration. They've been tested according to MIL-STD-810G Method 516.6 Procedure I for functional shock (i.e. assessing physical integrity, continuity and functionality while installed), and Method 514.6 Procedure I for vibration (i.e. using vibration shakers are used for fixed vehicle mount simulation testing). Shock and vibration resistance are the most important ruggedness criteria for a vehicle-mount system. And proper mounting is of crucial importance in minimizing the overall potential for damage in a vehicle-mount. The IP (Ingress Protection) rating describes a unit's ability to withstand dust and liquids. IP65 is what is needed for operation in harsh environments. The "6" means the device is totally protected against dust. It's the highest solids rating a device can get. The second number indicates protection against liquids. A "5" means the device is protected against low pressure water jets from all directions. Winmate heavy-duty panel computers come in many different configurations. Our IP65-rated model came with three IP65-rated M12 style screw-on ports and special adapter cables for wired connectivity. The standard three M12 connectors provide power, RS232 serial, and LAN/USB combined. In display-only versions of the panel, one of the M12 connectors provides VGA video instead of serial. 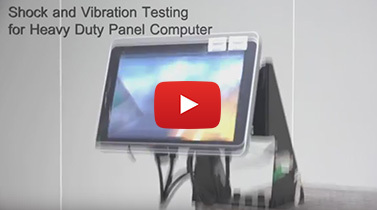 In our testing, Winmate's heavy-duty panel computers felt exceedingly solid and exceptionally well-made. Fit and finish are of very high quality, as one would expect from an experienced vendor.